I believe it was one of the few occasions the old DUKWs and the new LARCS operated together. 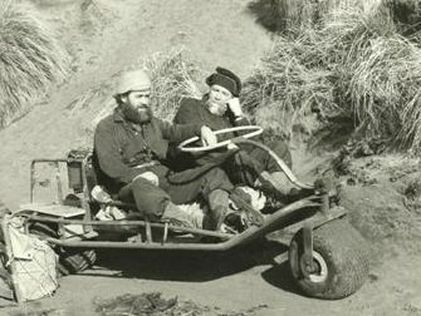 William (Bill) Edgar and Jim McLaughlin (OIC) on the Gnat. 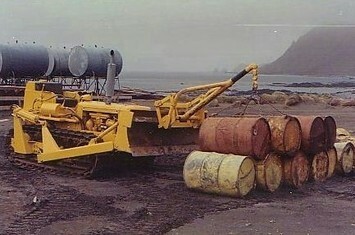 A photo of the Drott that was reclaimed from the Macquarie Island tip. As my memory recalls the make of the earthmover was International. They came in all types and combinations, in this case this was a bulldozer, hence the blade in front.They were classed as wheel or track driven. In this case as obvious was track. I can't recall the year or model of the machine,but I know it was pretty old. It wasn't a straight diesel engine but what was known as a semi- diesel.In other words it started on petrol and changed over to diesel when hot!.That will give you some idea of the age of the monster?.I tried to order parts through ANARE, but was told it had been written off, so had to make and adapt parts to get mobile.Anyway I reckon it was worth the effort as it was a great asset to all of us!.It was used as a crane , a forklift, and of course a bulldozer. 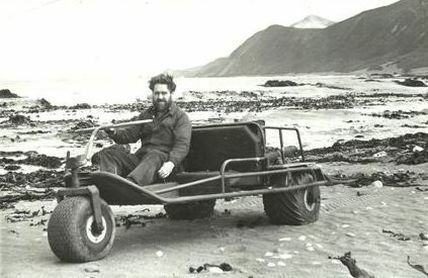 This machine was worth the trouble as it was very good in the sand. We made up the fittings to use as many accessories on the blade. This photo shows the jib which could lift two drums of fuel at a time and stack them. Trying to roll full drums in the sand was out of the ark. Making up the drum hooks was no problem! By the way Drott was a model name used by several manufacturers. From memory the weather was only good enough for two BBQ's during the summer but a real novelty and very much enjoyed, especially by the unruly mob of pups who were still young enough to have the run of the station. They are made up of two litters, Norma's and Shelag's, (named after Mrs Robinson). I took the photo in front of the electrical workshop right on the corner of what was known as Coronation Street. Given the cask of wine in evidence and the can of beer in Narra's hand it would have been a Saturday, ration day. 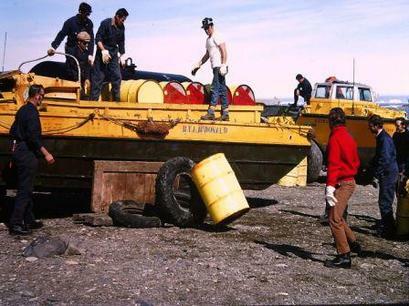 There were 26 of us at Mawson in 1974. The 14 men in the photo are from left to right: Garry Clark, Adrian Stone, John Dare, Dave Armstrong, Dave McCormack, Frank "Narra" Johnson, Ted Giles. Graham Henstridge, Graham Dadswell, Brendan Godwin, Dr Bill Griffith, Wade Butler (long lost in the Tasmanian bush), Peter Cameron and Mike Heap. Including myself makes 15 out of the original 26, we tragically lost Geoff Cameron early in the year and the rest of the party were out on a tractor field trip. Obviously Geoff's death so early in the expedition put a shadow over our time at Mawson but I would still describe it us a good year, certainly one of personal growth and education for most of us. The graves of the 3 men who died here, Robert White (1963), Ken Wilson (1972) and Geoff Cameron (1974) are on West Arm looking across to Mawson. 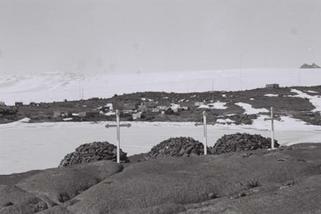 They are very much a part of Mawson - the simple yet elegant white crosses visible against the rock of West Arm whenever you gaze out across the harbour. A reminder that life doesn't always work out how you plan it. The name itself is a bit of a mystery, earlier expeditioners may be able to enlighten us. (There is a song called Alice's Restaurant?) Basically it consisted of a very large wooden packing box which had been modified and stocked with emergency rations, stove and fuel for passing dog sledgers. It would have been placed there in the late sixties or early seventies, presumably when one of the Dan vessels passed by the coast. It was painted bright orange with the name Alice's Restaurant emblazoned on it. It is located three to four dog trip days from Mawson and I passed there twice on my way to Fold Island with two dog teams, the Oldies and the Kelly Gang, and was very grateful to have found the place which is well hidden behind a group of islands. (It was always my ambition to go on from there to visit the Russian Station but logistics and Head office said NO). You can see a beacon on the photo to guide exhausted travelers to the right place, basically it consisted of three 44 gallon drums welded together and was a welcome sight I can tell you. The main purpose of this location was to allow the Bios to study the birds at a nearby small emperor rookery along side Taylor Glacier, as far as I know the only rookery where the birds actually breed on solid rock rather than sea ice but I could be wrong about that, the attached photos tells the story. The place also has historical significance and maybe that was the true reason for its location. Mawson, on one of his journeys traversed in the region and I remember the comments regarding that fact made in the many log books which were kept in the box, it would be fascinating to know whether they still exist!